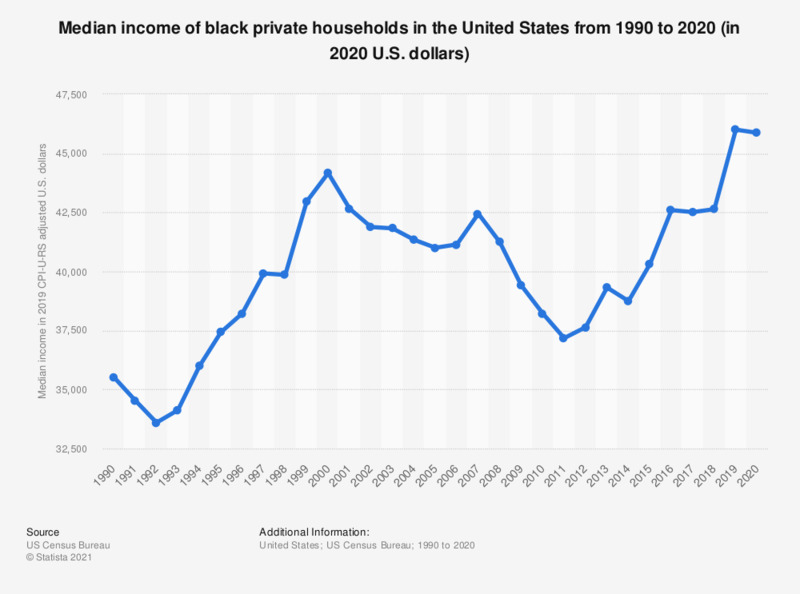 The statistic shows the household income of black families in the U.S. from 1990 to 2017. The median income in 2017, was at 40,258 U.S. dollars for black households. Income in 2017 CPI-U-RS adjusted dollars. Medians are calculated using 2,500 U.S. dollars income intervals. Beginning with 2009 income data, the Census Bureau expanded the upper income intervals used to calculate medians to 250,000 U.S. dollars or more. Medians falling in the upper open-ended interval are plugged with “$250,000.” Before 2009, the upper open-ended interval was 100,000 U.S. dollars and a plug of “$100,000” was used. 1990-2001: White, not Hispanic. 2002-2016: White alone, not Hispanic. 1990-2001: Black.